A few years ago I actually painted the above image in full colour. 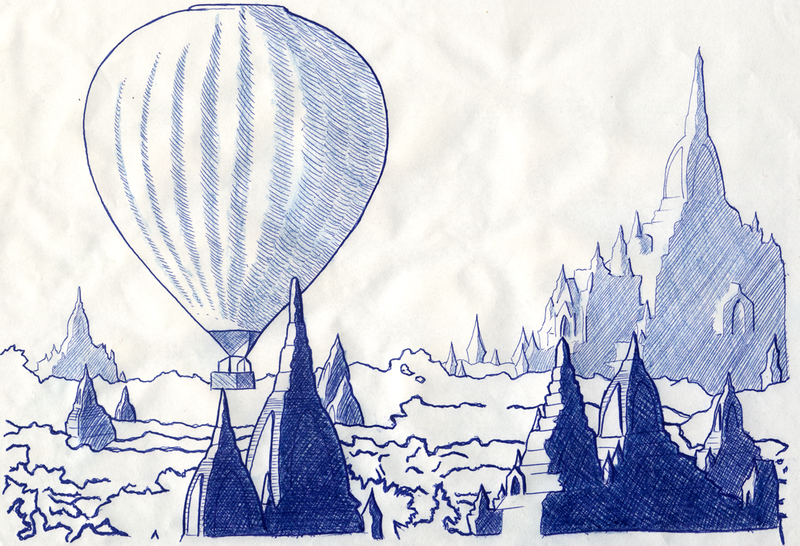 The deep blue balloon was against the rich greens of the jungle and a bright orange sunrise, echoed by the terracotta temples. But I gave that painting away. I don’t regret that. It is where it is meant to be. But I do wish I’d kept a copy. Now all I have is some preliminary sketches. The drawing above is just one of these. In fact, it is one of my favourites and I do think it works in it’s own right. Some time back I became very interested in lucid dreaming and the idea that, with practice, you can learn to become aware that you are dreaming even whilst still in the dream, and once you do, you can actually start to change the dream and to control it wilfully. This is an even more powerful idea when you consider the restrictions prisoners are subject to. Imagine having all those restrictions and yet still being able to live as you please, free to do anything, whenever you go to sleep. Then I started imagining all of the things I might dream about if I could, by which I mean all of the things I really longed to see and do, were anything possible. This picture was one of the things I came up with. Many people who saw the final painting asked why there are no people in the balloon. If you’re wondering the same thing then I’ll tell you what I told them. There is. There are two. You just can’t see them.